I’ve seen giraffe, cheetah and hippo counted amongst the infamous ‘big five’ in some safari parks’ bids to entice tourists – and while we can’t dispute the hippo is indeed a sizeable animal, it is not one of the big five. They might be responsible for nearly 3000 deaths a year, more than all the ‘big five’ put together in fact, but the key point is they aren’t exactly hard to hunt and kill. 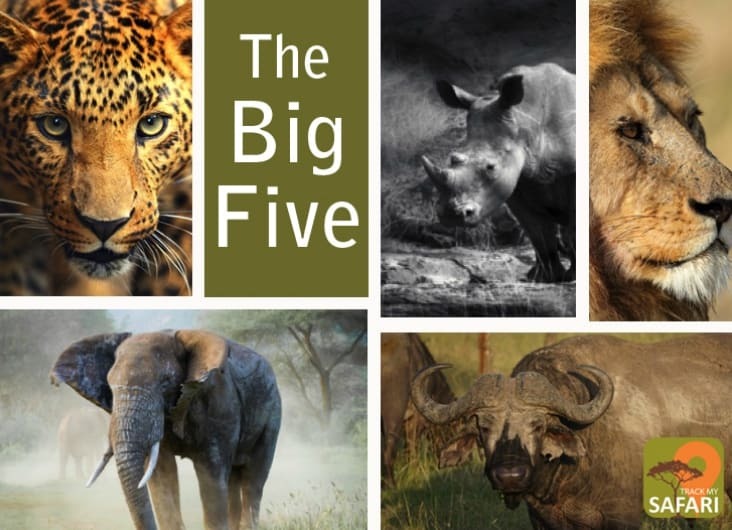 The bonafide big five were named for being the hardest to hunt: the lion, the leopard, the elephant, the rhino, and the buffalo. It seems incredible that even though lions have been hunted for over three thousand years, we have managed to reduce them to ‘vulnerable species’ status in the last two decades, hacking their numbers by 60% to a mere 20,000 in the wild today. As long as hunting is a significant source of revenue for desperately poor sub-Saharan countries, there is little motivation on the part of governments to impose more rigorous restrictions. The practice generates nearly US$200 million annually, and with a lion being the ultimate prize costing approximately US$20,000 to hunt and kill an easy calculation shows just how many animals appear on trophy hunters’ walls each year. Ensure that any safari you join is acting responsibly when it heads off in pursuit of any of the big five, that the animals are left undisturbed and they aren’t being encouraged to become overly familiar with humans. As with bears in the United States, once an animal becomes accustomed to being around people you have essentially signed its death warrant. Enjoy the majesty of each of these fine beasts from behind the safety of a zoom lens and remember that they never invited you into their territory: you imposed yourself upon them. Act accordingly. Lion: we all grew up with Leo the lion’s MGM roar, something that has become a cliché on the big screen but when it happens in the wild the sound is felt as much as heard. A lion’s roar can be heard over five miles away, and it is used to stake a claim to territory or to gather a pride back together. More than 17,000 years ago lions were being daubed on cavemen’s walls; today, we officially identify eight separate species, seven of which can be found in Africa. All are majestic, powerful, and make for seriously addictive viewing. Leopard: fortunately for researchers leopards genuinely never change their spots, making it infinitely easier to identify individuals. These shy cats are far and away the most elusive of the big five: in South Africa, the population is estimated to be between 2100 and 6800 – that’s how hard they are to follow. Able to run at 36mph, leap further than 6 metres horizontally and 3 metres vertically, they are impressively competent killers. Since they hunt at night they are most likely to be seen during the day seeking shade in the branches of a tree or curled up in a thicket. Saying that, I was once fortunate enough to spend half an hour with a mother and her two cubs just a few hundred yards from Kruger’s Malelane entrance gate: it was midday, there were no other cars around, and I spent thirty minutes barely remembering to breathe. Looking into a leopard’s eyes, exchanging a silent moment, is one of the most overwhelming experiences you’ll ever have. Elephant: ever since I first petted a rescued baby elephant in northern Thailand, feeling the thick, coarse hair all over his body, I have been in love with these creatures. Read Lawrence Anthony’s ‘The Elephant Whisperer’ and you’ll be spellbound by these gentle giants. Botswana in particular has a serious elephant over-population problem: in a bid to preserve the Okavango Delta they took herds of them down into the far south of the Central Kalahari, but within weeks they had returned home. My favourite elephant fact? Their closest relation is the Dassie, a pint-sized rabbit-like creature that can be found sunbathing at Cape Point, Cape Town. Rhino: an encounter with a white rather than a black rhino is far more likely, and of course we have rhino poaching to thank for that. ‘White’ and ‘black’ have little to do with the colouring and there are a multitude of theories as to the name origins. However, it’s easy to distinguish the two: the white rhino is a grazer with a very wide lip, whereas the black rhino is a browser with a hooked lip. My most extraordinary meeting with a black rhino was in the Khama Rhino Sanctuary in Botswana, when one visited the swimming pool I was idling in after a hot day’s driving. It’s hard to say which of us departed with the more bemused expression. Buffalo: known locally as ‘the Black Death’ and the ‘Widowmaker’, buffalo are extremely dangerous. Herd sizes change throughout the year along with the breeding seasons but up to 500 animals will travel together at a time. The elaborate horns often look something like a judge’s wig, a perfect companion to the typically unamused expression on their faces. It is incredible how one buffalo will appear from the undergrowth and then, somehow, hundreds more will follow from a seemingly empty landscape. That such enormous animals in such vast numbers can be camouflaged so effectively is an intriguing blend of fascinating and downright terrifying. Like this content? Sign up for free updates.